Sunrise at Coral Cottage this morning. Driving down the road the other morning, I spotted a pheasant. Screech. I slammed on my brakes put it in reverse, pulled out the old point and shoot, snap and happy was I. What is the big deal? 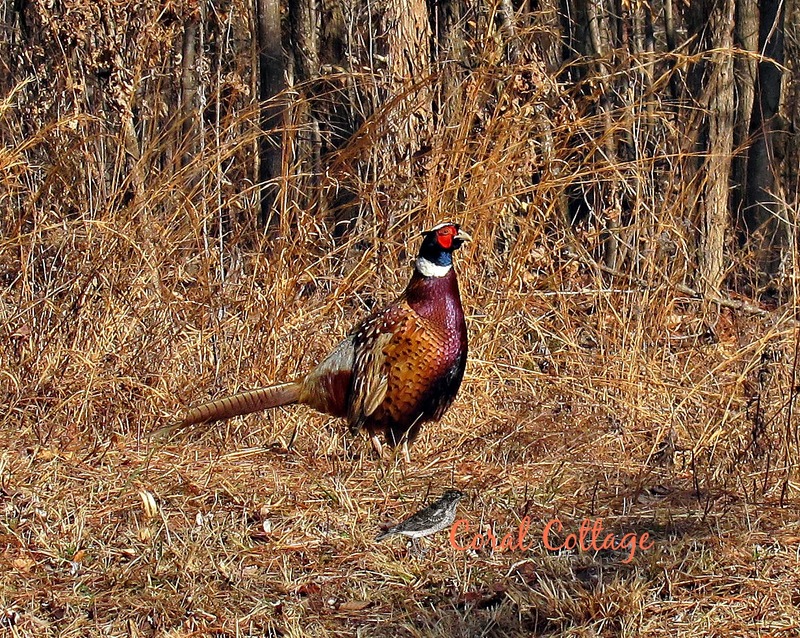 Around here, we don’t see pheasants walking around willy nilly; so it was a big deal to me. Not to mention, that I lose my mind over birds, at the drop of a hat. 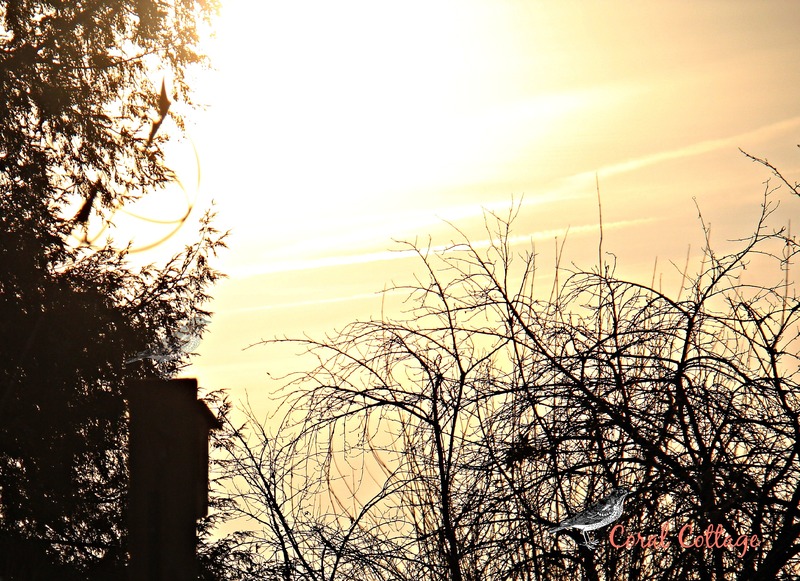 He has the most amazing colors that sparkle and shine in the sunlight, don’t you think? Early Saturday morning I was out watering the cat, when I heard this loud raspy honking noise. I went to investigate in the direction from which it came. The cat shot off towards the door in a hurry – scared to death. There at the foot of the driveway was the pheasant. I quickly ran in, got the camera and back out in a flash. The pheasant was gone when I returned. I walked around looking for him. I couldn’t see him, but I could hear him down in the woods calling and foraging. Do you have a vegetable or other food, that you thought you didn’t care for – only to find out otherwise? I spent my life not liking brussel sprouts. I probably had them once, they were over-cooked mushy and they stunk. Then one night recently at a friend’s house, she cooked brussels sprouts. She is a great cook, but even so my first thought was how was I going to get them down, as though I liked them. I was honest, told her I didn’t care for them, but would give it a try. I did. They were good. Soon after, my sister made a brussel sprout dish that I liked as well. Go figure I spent all those years hating them, and it turns out, they aren’t so bad. Last night I made some for the first time. I decided to make up my recipe, loosely based on Ina Garten’s roasted brussel sprouts. Sliced sprouts, and then every thing is better with bacon. Olive oil, onions, s&p, garlic, and hot hungarian paprika. Roast for 30 mins, then a drizzle of balsamic vinegar, tossed in a few raisins and roasted for another 5-10 mins. I over cooked them, because I was so busy getting caught up in pheasant hunting. The pheasant showed up again, and I got completely distracted watching him and trying to take photos. He didn’t seem to be too bothered by me, but he wouldn’t let me get close enough for a good shot. The natural camouflage is amazing. 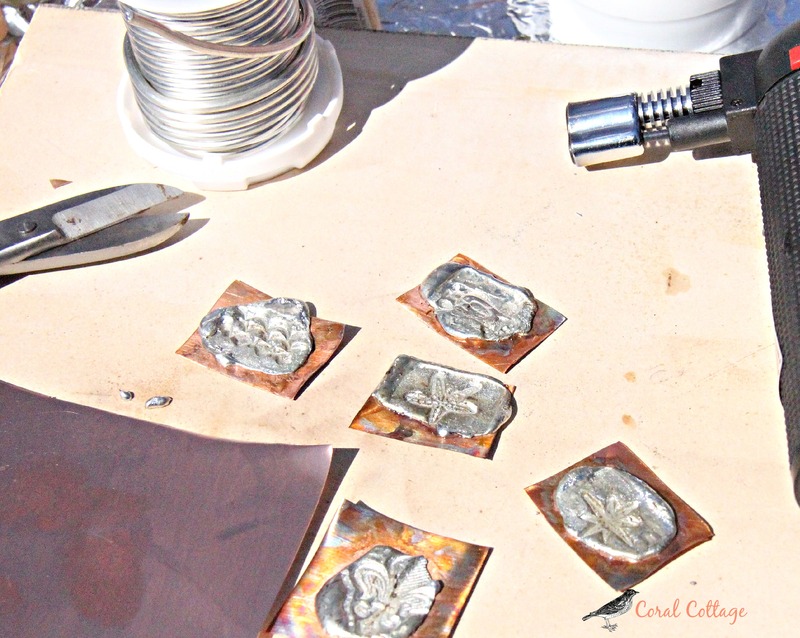 Warm weather on Friday allowed me to set up a work station outside and do some soldering with my copper jewelry. The pieces still aren’t finished, I have some equipment on the fritz so until another time; they remain incomplete. That’s life at Coral Cottage. 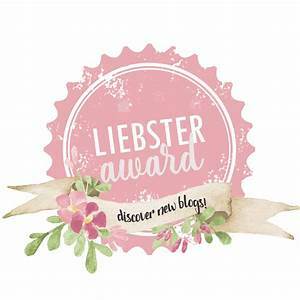 Kim of Red Dirt Farm • This entry was posted in Cooking, jewelry, Photography, weekend updates and tagged brussel sprouts, cooking, copper and silver soldering, jewelry making, photography, wild pheasant. Bookmark the permalink. A beautiful pheasant, Indeed! Welcome to the brussel sprout family. Oh, yay, another way to prepare brussel sprouts! That looks yummy. Like you, I used to think I hated them but have found that lots of things, including brussel sprouts, taste good when roasted. I am looking forward to trying out your recipe. 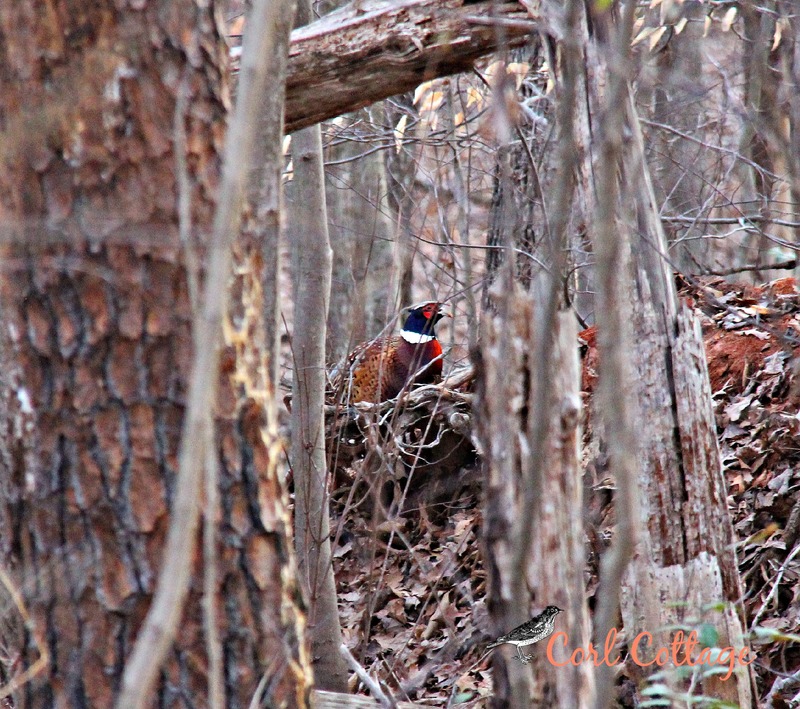 Love the pheasant~ I know they aren’t native, but I do the same thing when I see one: SCRRREECH! I understand from naturalists I know that soon we will be seeing turkeys running around, as they are making a comeback. Beautiful bird. I hunted them at home in Pa. None in Va. when we moved here. They were first introduced in Va. by the Game Commision in the 1960’s in Isle of Wight Co. Now I think they are fairly well spread but still not abundant. My father was an excellent pheasant hunter. Their escape flight is different from other game birds and he knew how to catch them at the critical point. I never could do it like he did even though I knew what he did. If your friend wants to see turkeys she should spend some time in the Buckingham State Forest. When I was doing research there, there were so many that we had to be careful driving in the early morning because we never knew when they would run or fly across in front of you seemingly out of nowhere. But the population is affected by many factors- drought, foxes, mast quantity and quality. I suspect that this was a very bad year since there were no white oak acorns. Your pheasant has beautiful colors not to mention being the Coral Cottage Distraction and murderer of the brussels sprouts. I won’t eat the things either but I like cabbage and broccoli. Go figure. I get what your sayin’. I’ve used that art for the heart line before, in a previous life. Hope you feel better now. 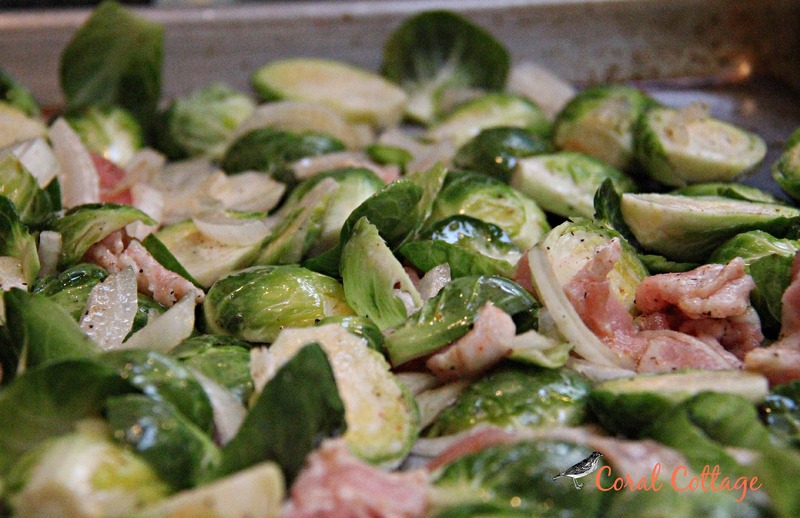 Yum on the brussel sprout recipe you shared! I never would have thought of adding the raisins. I grew them summer before last. Such a neat experience to watch them grow and then to harvest. However, I think I will keep purchasing them rather than growing them. Just didn’t get enough at any one time for the trouble. Raisin do add a nice sweetness to the sprouts. I think they would be fun to watch grow. I wish I had the space and energy to grow everything I wanted. Hugs back at you.